New Secrets Of Easter Island Statues Revealed – The Heads Have Bodies Too! This is a classic example of “there is more to it than meets the eye”. Images from the excavation of Easter Island’s renowned giant head statues has revealed that the heads actually have bodies that extend deep underground and the bodies are in fact marked with detailed tattoos. The Easter Island Statue Project has been excavating two of 1,000-plus statues on the Easter Island, one of the most remote inhabited islands in the world, and the images uncover the secrets of the mysterious stones and the people who built them. The team of archeologists also found large quantities of red pigment, some of which may have been used to paint the statues. 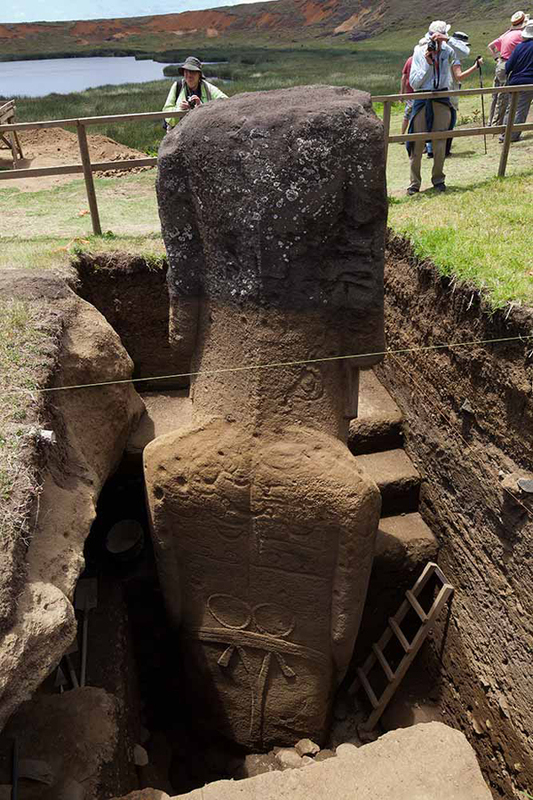 “Our EISP excavations recently exposed the torsos of two 7m tall statues. Hundreds, perhaps thousands, of visitors to the island have been astonished to see that, indeed, Easter Island statues have bodies! 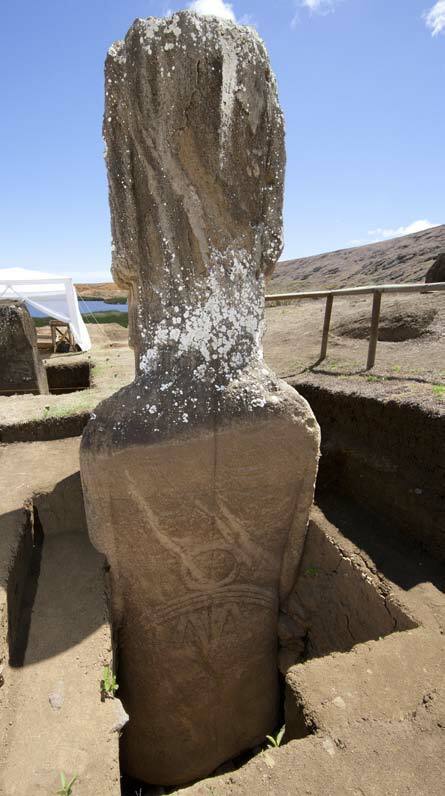 More important, however, we discovered a great deal about the Rapa Nui techniques of ancient engineering,” said Jo Anne Van Tilburg, Director, EISP, on the project website. 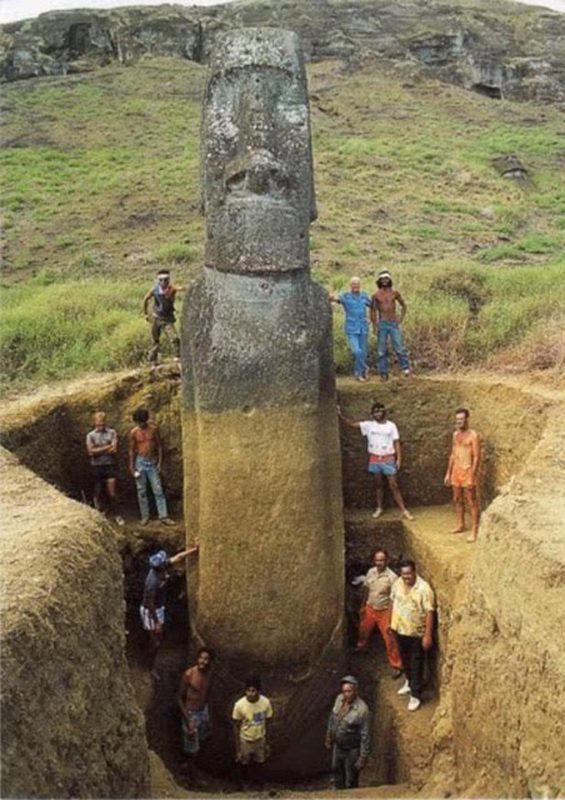 “The reason people think they are [only] heads is there are about 150 statues buried up to the shoulders on the slope of a volcano, and these are the most famous, most beautiful and most photographed of all the Easter Island statues. This suggested to people who had not seen photos of [other unearthed statues] that they are heads only,” he added. The team has also discovered that the dirt and detritus partially burying the statues was washed down from above and not deliberately placed there to bury, protect, or support the statues. The statues were erected in place and stand on stone pavements. Post holes were cut into bedrock to support upright tree trunks. Rope guides were cut into bedrock around the post holes. Posts, ropes, stones, and different types of stone tools were all used to carve and raise the statues upright. In the pavement under one statue, the scientists found a single stone carved with a crescent symbol said to represent a canoe, or vaka. The backs of both statues are covered with petroglyphs, many of which are also vaka. A direct connection between the vaka symbol and the identity of the artist or group owning the statue is strongly suggested. 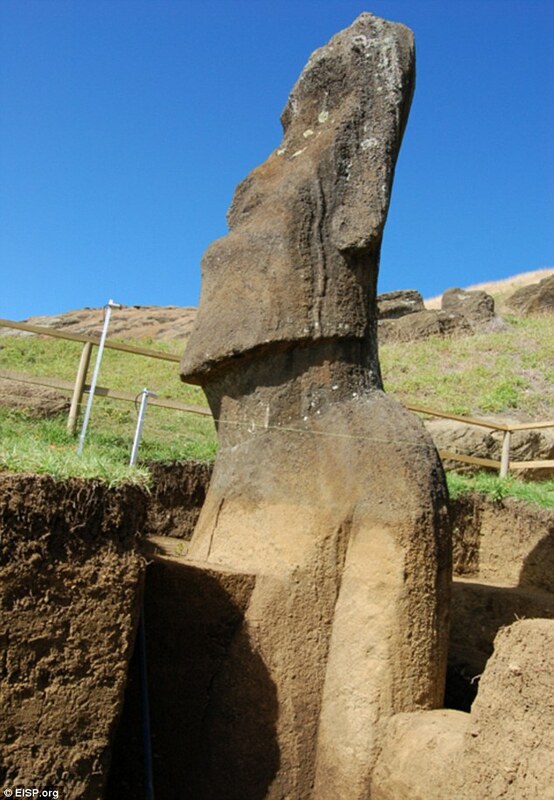 The Easter Island statues, called Moai , have dotted the Chilean Polynesian island since 1250 C.E. At 82-tons, the tallest of them reaches an impressive 33-feet high.